Chiropractors deal with every joint in the human body, however primarily they deal with the spine. The spine is such an important structure because it houses the central nervous system. Your nervous system consists of your brain, spinal cord and nerves which supply information to all of the cells in your body. Pain and sensation tell the brain how you are feeling, and those signals pass back through the nervous system via a similar path way. The expression of this information by your nervous system gives life to all the cells and structures in your body. Your spine consists of 33 bones called vertebra. These vertebra stack on top of one another to create a protective mobile housing for the spinal cord. Holes exist within the spinal canal for nerves to exit allowing for information to be supplied to surrounding muscle tissue, tendons and organs. As chiropractors when we examine the spine we are looking for vertebral subluxations. Subluxations are a malposition or a lack of motion at either a motion segment or a single vertebra in the spine. When this occurs it interferes with the flow of information through your nervous system. This interference results in a reduction in the function of the body’s cells and organs. There are over 3 trillion processes occurring in your nervous system every second, and only a few of these are under conscious control. This is why pain is not a good indicator as to whether there is a subluxation present. Quite often there are no obvious symptoms noticed. When defining health, it is often thought to be the absence of disease. However health is far more than merely not being sick, it is the optimum function of all of your cells and tissues all of the time. If your nervous system is functioning correctly then all of your organs and tissues have the potential to function to their optimum. Subconscious processes such as elimination of toxins, blood pressure, hormone release and the billions of activities occurring in the body, every second can occur as they are designed to, free of interference. Subluxations decrease the performance of the nervous system and this decreases the performance of the body!! Chiropractors use adjustments to correct subluxations. An adjustment is a specific correction, where a contact is taken on a single vertebra, and a specific force in a specific direction is applied. This is designed to help increase the movement and re-align the vertebra, helping to restore normal function to the spine and nervous system. An adjustment can be delivered in numerous ways. If the adjustment is made manually quite often there is a pop or a cracking noise. This sound is called a ‘cavitation’ and is a release of a nitrogen gas bubble from within the joint it occurs as a result of a change in pressure. Other techniques utilised for adjusting include the drop table. The principal is the same, and as the table drops away, you rarely experience the cavitation. 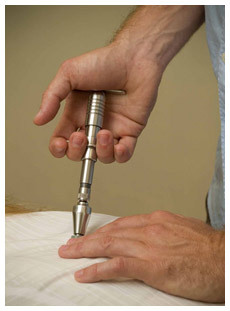 Another instrument used during an adjustment is the activator. It is designed to give a high velocity and low amplitude thrust – a force which is hardly felt. Generally, adjustments are free of pain, and in most cases people find treatment very relaxing. Chiropractic has been shown to be extremely safe and effective. In Australia there are around 200,000 patient visits to a chiropractor every week, with few other professions able to demonstrate the same safe and effective relief to back pain neck pain, headaches and general health benefits. When comparing Chiropractic care with a course of anti-inflammatory drugs, a study found that chiropractic care was 250 times safer (Dabbs, and Lauretti JMPT 1995 18(8):530-6). Other studies have found chiropractic to be approximately twice as effective and half as expensive as other forms of therapy for the spine. Chiropractors are the only health professionals trained to locate and correct subluxations. In Australia, chiropractors study for a minimum of five years full time at university, graduating with either a double Degree or a Degree in Chiropractic Science and a Masters of Chiropractic. Training includes anatomy, physiology, pathology, diagnosis, radiology, orthopedics and neurology. Chiropractors are fully licensed primary health professionals and are governed by registration boards in every state. Following an adjustment, some people may feel a slight soreness following their first few adjustments. This occurs as the body re-aligns and generally only lasts a short time. Other very slight risks include sprain/strain injury to a ligament or disc in the neck (1 in 139,000) or the lower back (1 in 62,000). Chiropractic adjustments avoid the side effects commonly associated with trying to control the body. Prescription and ‘over the counter’ medicines involve a much greater risk than chiropractic. As an interesting conclusion, statistics tell us you are more likely to be struck by a bolt of lightning than experience a serious adverse reaction to chiropractic care!